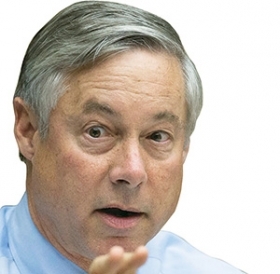 U.S. Rep. Fred Upton, R-Mich.: "This is a life-saving endeavor." WASHINGTON (Reuters) -- House Republicans today defended an industry-backed legislative proposal that would award automakers credits against federal pollution standards for adopting advanced collision-avoidance technology in cars and other light vehicles. The measure drew fire at a committee hearing from Democrats and regulators, who criticized the approach as an unacceptable trade-off between auto safety and public health that added to other concerns about the draft bill. Republicans described the credits as an incentive for innovations such as collision-avoidance vehicle-to-vehicle (V2V) technology that experts say could eliminate a majority of traffic accidents involving unimpaired drivers. The proposal, contained in a 62-page draft bill written by the House Energy and Commerce Committee's Republican staff, would give automakers greenhouse gas emission credits of at least 3 grams of carbon dioxide per mile for a vehicle with three advanced safety mechanisms and 6 grams for a vehicle that communicates with other cars or highway infrastructure. Under EPA rules, automakers must reduce carbon dioxide emissions for cars and light trucks to 163 grams per mile in model year 2025, down from 232 grams in 2018, according to the Center for Climate and Energy Solutions. Credits available under the Republican proposal would represent about 4 percent to 9 percent of that gap. "This is a life-saving endeavor," said U.S. Rep. Fred Upton, R-Mich., the committee's chairman. He added that the pollution credit approach "incentivizes automakers to invest in new safety technology that will save more lives." Auto industry representatives told the hearing the credits would reduce greenhouse gas emissions by avoiding crashes that cause traffic congestion which in turn dumps millions of tons of carbon dioxide (CO2) into the atmosphere. "There is a direct link between reducing crashes and reducing CO2 emissions," said Mitch Bainwol, president of the Alliance of Automobile Manufacturers, a Washington-based industry lobbying group. But Mark Rosekind, head of the National Highway Traffic Safety Administration, which oversees fuel standards, said the auto industry is already adopting safety technology including automatic emergency braking and V2V communications and needs no additional incentives. "Save lives, prevent injuries -- that should be the highest incentive that anybody needs to add advanced technologies," Rosekind said. Democrats called the proposal a mistake, as the committee investigates Volkswagen AG's use of a software 'defeat' device to evade U.S. emission standards. "This bill essentially creates a congressionally sanctioned defeat device," said U.S. Rep. Frank Pallone, D-N.J., the committee's top Democrat.